When did humans last run? You know, really run. To spear a wooly mammoth so we wouldn’t go hungry. Or to chase away a wild animal who is circling our campfire. All that good stuff died out somewhere between the last ice-age and the invention of the light bulb. Granted, Deliveroo is far more reliable than throwing a sharpened stick, and Netflix is a fall back if you need a good scare. But somewhere in Homo sapiens’ progress from lion-skin leotards to long-johns and lycra, perhaps we lost a little something along the way. With these primal feelings awakening, I did a little research this autumn. While the UK’s most fearsome woodland animal is the rogue energy-gel-stealing squirrel, in Europe it’s a different story. Moose, wolverine, lynx, brown bear and yes, wolf still stalk the forests. In fact, the wolf has recently been making a resurgence and there are now 12,000 grey wolf across the continent. Resolved to run some trails, while reconnecting with my inner savage, I hastily booked a ticket. Västmanland in Central Sweden, I discovered, was as stocked with wild animals as any self-respecting safari park. And to ensure I didn’t turn chicken when heading out among the wolves, I recruited my younger sister to add the necessary social pressure. In less than a month, we were on the ground in Scandinavia. We launch our trip from the pint-sized city of Västerås, or as the Swedes pronounce it, “Westeros”, (this Game of Thrones rip-off is a point of pride for local Swedish fans). The fantasy world connection continues as we study maps of the endless enchanted woodland that stretch beyond the city limits. A whopping 70% of Sweden is covered by trees. The UK barely scrapes 10%. It’s almost dusk by the time we lace up on the first evening – and we pack our headtorches. Picking up a convenient and quiet river trail, we jog north towards the city limits. Houses peel away almost immediately, replaced by tall stands of Scots pine. The Swedes are an outdoorsy, playful folk. On this warm autumn evening many are out strolling, exercising the dog or partaking in an impromptu school-sports-day style sack race…with no children in sight. After five miles the trail suddenly narrows, and the trees change from coppiced wood to thick, undergrowth-heavy forest. We stop here, and just before beating a hasty retreat, we peer deep into it with our headlamps. There’s a shudder of leaves. A horned roe-deer races away into the night. Have we finally reached where the wild things are? Discover the best running gear of 2017 with the December issue of Men’s Running. In our annual Men's Running Awards, our team of real runners has tried and tested over 1,000 products to give you an impartial guide to the very best shoes, kit, tech and nutrition of 2017. 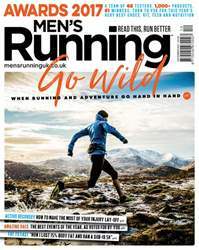 We're not just helping to fill out your Christmas lists, though; this issue, we sent writer Matt Maynard to the wild forests of Sweden to find out, among other things, what it's like to run with wolves. Hopefully it inspires you to set out on your own running adventure, away from the stresses and strains of everyday life – deadly animals optional. Elsewhere, regular contributors Steve Way and Rob Kemp both turn their attentions to the subject of staying fit while injured. The impact nature of our sport means we’re all destined for at least a brief spell on the sidelines, but it's what you do during your injury lay-off that determines how quickly you can get back into the swing of things. All that, plus the usual run-boosting advice, inspiration and race reports in the December issue of Men's Running.